In which a recruit’s name is plugged into Google and the bits of information that trickle out–guru ratings, newspaper profiles, YouTube highlights, all that stuff–are synthesized in the hopes of getting a clearer picture of the player we’ll see at Auburn next fall. Previously: Jessel Curry, Craig Sanders, Roszell Gayden, Brandon Mosley, and Demetruce McNeal. Jake Holland wasn’t the first commitment of Auburn’s Class of 2010; that honor belongs to lifetime Auburn fan Cody Parkey, who committed so long ago Tommy Tuberville was still the head coach at the time. But Holland came close, committing along with Shaun Kitchens on the same day last April. And like Kitchens, Holland was a rock throughout the recruiting cycle, frequently turning up as one of the players working hardest to bring other recruits into the Auburn fold. By the time Signing Day rolled around, Holland had cemented himself as possibly the most well-liked recruit amongst Auburn fans in the entire class. Not bad for a former Tide fan, huh? HIGH SCHOOL: Ranked as the No. 12 player in Alabama by SuperPrep … Named to the All-Southeast Region team by PrepStar … Ranked 20th among middle linebackers by Tom Lemming on Maxpreps.com … Selected to the 2009 6A All-State Team by the Alabama Sports Writers Association as a senior … Was a participant in the 2010 Under Armour All-American game … No. 10 on the Birmingham News’ list of the Alabama Super Seniors … Ranked 12th on the Mobile Press Register’s 2009 Elite 18 … No. 109 on the Mobile Press Register’s Super Southeast 120…Member of the Orlando Sentinel’s 2009 All-Southern football team … Finished his high school career with 351 tackles … Totaled 153 tackles, 16 tackles for loss, a sack, four pass breakups, four forced fumbles, three interceptions and three fumble recoveries as a senior … Racked up 129 tackles (74 solo) as a junior to go along with two sacks, eight quarterback hurries, one interception, one fumble recovery and five forced fumbles. I believe that even in high school, 282 tackles in two seasons is a fairly impressive number, don’t you? 16 TFLs for a middle linebacker–better than one a game–against 6A competition? Also impressive. Three or more PBUs, picks, forced fumbles, and fumble recoveries? Yes, impressive. Put all that impressiveness together, and you’re looking at a guy that was around the ball as often as the guys on the other side of the line of scrimmage. FYI: Rivals lists his 40 time as 4.53 and his bench-press max as 345 pounds. Just so you know. RECRUITNIK HOO-HA: When Holland first committed, the gurus saw just another smart, fundamental, run-of-the-mill three-star player. By the time his senior year was done–what with the 153 tackles and trip to the ESPN Under Armour All-American game–things were a little bit different. Not totally so at Scout, where he received three stars, was named the nation’s No. 12 middle linebacker, and the No. 12 player in Alabama. But at Rivals, Holland wound up with four stars, a grade of 5.8, and the No. 8 inside linebacker ranking. Holland also got shout-outs as the nation’s No. 5 run-stopping LB and the No. 10 player in the state. It’s difficult to find many fundamental flaws in Holland’s game at linebacker. He is smart, tough, instinctive with the versatility to play inside or outside at the next level in our eyes. Has good size with his bulk and compact, durable frame … Between the tackles he is very reactive and finds the football quickly. Mirrors the ball carrier well with good short-area redirection skill and lateral agility. Stays square to line of scrimmage helping him limit cutback creases and avoid being turned out of the hole. Shows good downhill quickness and burst filling his middle and backside run gaps; often beats blockers to the point of attack and makes plays on the ball inside-out … A guy who can hold his base. Displays good hand technique and strength shedding and keeping blockers off his body when scrapping. Pulverizing tackler who drives through the ball carrier from his hips but does not always get his head around. Flashes good chase speed and closing acceleration when supporting the outside run. Plays with a high motor and pursues well sideline-to-sideline. What really stands out his hip-fluidity and athleticism in coverage for a thicker linebacker. Doesn’t lose a lot in transition opening and turning. Ball and awareness skills are very good. However, he does show some stiffness at times breaking down in space and is a guy with good football speed but is not overly fast … Lacks sharp change-of-direction skill. When projecting inside, he does need to add some size and improve his short-area power at the point of attack to remain productive and durable. Moves well laterally but we have not seen great fluidity slipping or sidestepping the trash which he will need to do until he gains the required bulk. Overall, we still feel Holland projects to be a very solid and productive linebacker at the next level in a blue-collar type style. Potentially the leader of his defensive unit and a guy with invaluable intangibles. Scout also mentions Holland’s intangibles; when the gurus (which usually stick strictly to the athletic side of things) are able to notice those sorts of things, you know they’re, well, noticeable. One of those intangibles was Holland’s mad academic skillz, which got him offers from Duke, Stanford, UCLA, and–you guessed it–Vandy. Tennessee and both Mississippi schools also offered. So maybe Holland wasn’t one of the top-rated players of Auburn’s class, but for a guy without that high-end athleticism, a boatload of BCS-level offers and a fairly high level of guru acclaim should tell you how polished and productive he already is. From his senior year, you can watch Holland take on Vestavia Hills or Tuscaloosa County or Wetumpka. Thanks, “JakeHollandLB5,” whoever you are! 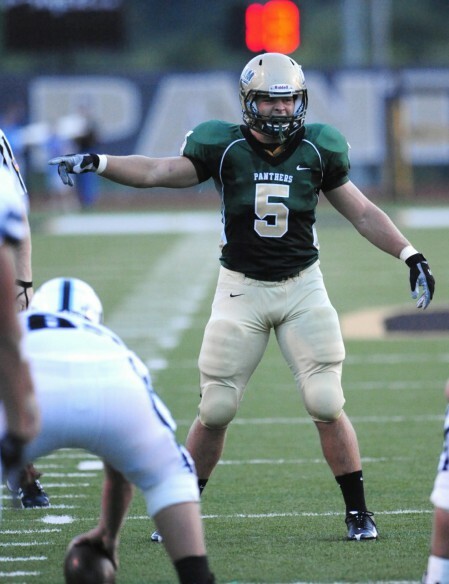 Pelham’s Holland began working with a personal trainer as an eighth-grader and by the time he was a freshman for the Panthers, his dream of playing college football was firmly entrenched. No matter the time of the year – Holland even spent extra time working out during football season – Holland attacked his goal with the same zeal he assigned to opponents on the field. The 6-foot-1, 229-pound Holland weighed about 200 pounds when he began his road to success as a freshman. He maxed out on the bench press at 275 pounds and could squat about 315 pounds while running the 40-yard dash in 5 seconds. Those numbers have improved to 350 pounds maximum on the bench with a 480-pound squat and 4.53 time in the 40. Growing up as an Alabama Crimson Tide fan, Pelham senior Jake Holland never imagined that he would one day suit up for the cross-state rival Auburn Tigers. But that day became a reality in April when Holland became the first defensive commitment for first-year head coach Gene Chizik. The highlight of his season came in week 4 when the Panthers outlasted Vestavia Hills in triple overtime to hand the Rebels their only Class 6A, Region 6 loss of the season. Holland had 24 tackles in the thrilling victory, including 15 solo and nine assists with four tackles for a loss. For his career, Holland finished with 351 tackles in 31 games played. I’ll do the math for you: that’s 11.3 tackles per-game. Over three years. Holy crap, man. “I’m not interested in going through all the recruiting hoopla. That stuff doesn’t win championships, players do. I want to help Auburn recruit the best players in the country,” he told AuburnSports.com. By all accounts Holland did just that … and if you believe this second-hand report from Mark Murphy at Track ‘Em, so did his Mom and Dad. There’s another worthwhile commitment article at the Shelby County paper. Even so, it’s Holland’s strong, textbook-sound play against the run that is his calling card, as he racked up 153 tackles this season. You can also hear Holland talk to the paper before the Under Armour game about why he chose–and stuck with–Auburn. Something to remember is that Holland was the leader and clearcut best player on a defense that also sent a player to Florida St. Sent a linebacker, in fact. Lastly, there were a lot more Jake Hollands out there on teh Intarwebs than I’d expected. Here’s the strangest Jake Holland-related thing I found. 6. Do I really need to go on? The one caveat might be that Holland should have picked up one or two more high-level offers … but he committed so quickly and so firmly to Auburn, what would have been the point of any other team trying to make a late play for him? Truthfully, so many of Holland’s stock arrows have been pointing up for so long that it’s awful hard to see any real failure in his future. The only question is how much he’ll contribute and how soon … and the guess here is that with Josh Bynes departing after next year, Holland will take over as Auburn’s starting MLB as soon as 2011. Watching the Under Armour game one play that sticks out in my mind is the perfect open-field tackle he made on a running back after a catch in the flat…a running back named Michael Dyer, no less.